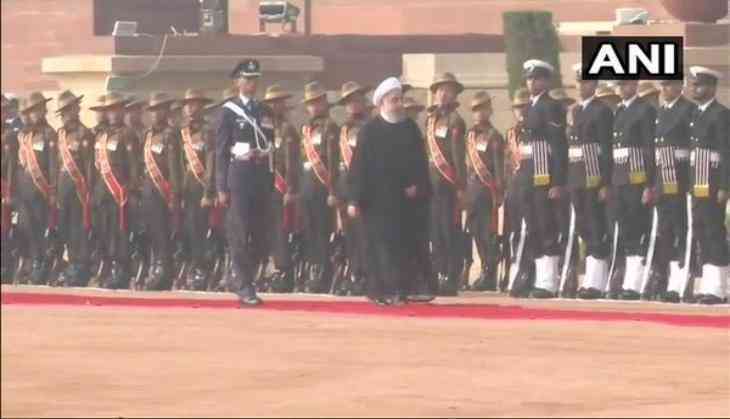 Iran President Hassan Rouhani inspected a guard of honour at the Rashtrapati Bhawan here on Saturday. He briefly met President Ram Nath Kovind and Prime Minister Narendra Modi and other government officials. Later, President Rouhani paid tribute to Mahatma Gandhi at Rajghat. He arrived in Delhi from Hyderabad on Friday. The Iranian President addressed a congregation of Muslims after performing Friday prayers at the historic Makkah Masjid in Hyderabad. He had stressed upon the cooperation between India and Iran in a bid to embolden the bilateral ties and also called for unity among Muslims across the world. Religious scholars from different schools of thoughts had participated in the session as well. In addition to this, Rouhani visited the tombs of Qutub Shahi rulers in the Golconda area in the city. This was the second time that President Rouhani was visiting Hyderabad, and the first visit after assuming charge as the President of Iran in 2013.